Keeping track of your calls is fundamental to the daily business of anyone in the entertainment industry. 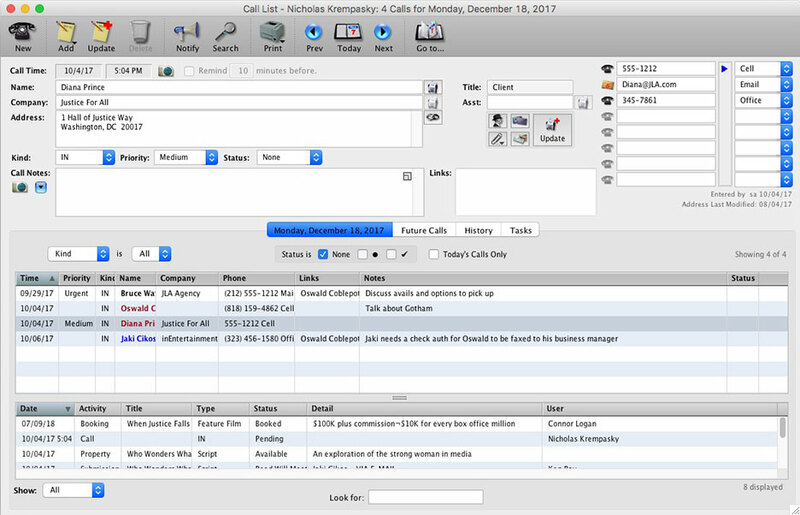 inEntertainment’s Call List Module was designed specifically to manage your calls as well as share that information with your assistant and colleagues. Reviewing the history between you and your business contacts is quick and intuitive. Many of the functions for the addresses module can be done directly from the Call List saving you time and additional mouse clicks. Update contact information right from the Call List. View the history of every interaction you or your associates have had with a contact. Drill down into a particular call and see how many times you traded calls before connecting. Print or email a customizable Call Report. Display your calls in any order you want. Use the inEntertainment Call List on your Android or Apple iPhone while you are away from the office. Link calls to Clients, Projects or other areas of the program. A specialized alert system allows assistants to instant message their bosses as to who is calling when busy with other tasks. Our call list is the most robust and full featured available at any price.